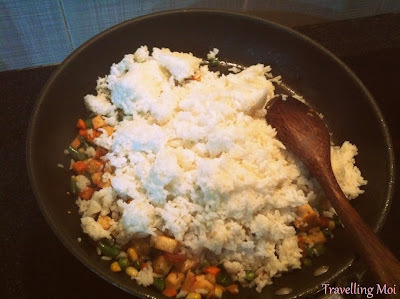 Travelling Moi: Fried Rice on a Lazy day! There are times (especially on a day off) when you just want to stay at home, maybe lying on a couch and do nothing. Sometimes we're just too lazy to do things that even taking a shower is too much. If you're too tired for take-outs and food delivery is just not for you or you're saving money, here's a cheap and fun easy way to cook on your day off! A healthy meal you can make from leftovers. 1) Deep pan with olive oil, turn the heat to low, saute chopped garlic. 2) Add tofu and shrimps, fry them. Then add corn, carrots, string beans, Saute. 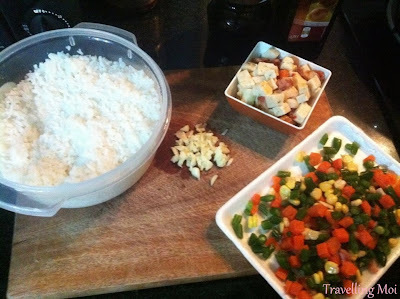 3) Add the leftover rice and mix them with the other ingredients. 3) Dash some salt and pepper then add soya sauce. Stir and cook for 10 minutes. 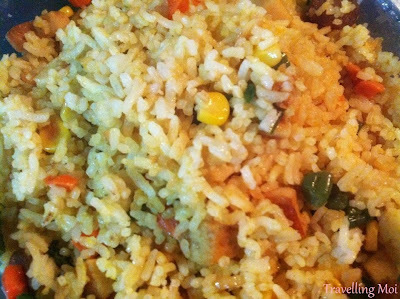 4) Serve fried rice while still warm.